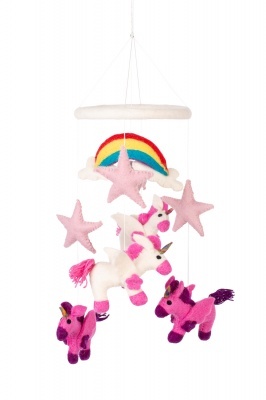 Everyone loves a unicorn, and this gorgeous handmade felted unicorn mobile features four of them, two white and pink, two pink and purple, each with a rainbow horn. They're joined by three fat pale pink stars and a rainbow towing a cloud, together creating a magical story for your child to tell themselves as they drop off to sleep underneath it. Sweet, pretty and made from 100% wool, it makes a splendid gift for your child or someone else's.